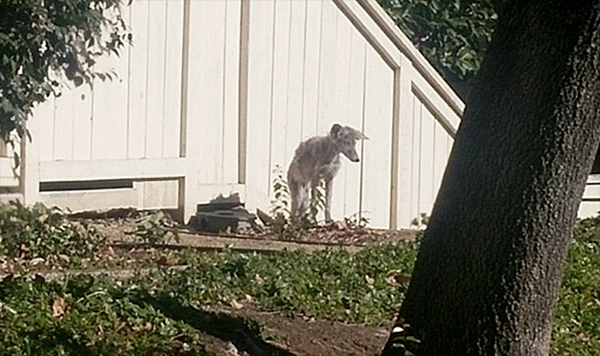 This picture was sent to us by someone worried about a coyote in their neighborhood. It's a coyote suffering from mange - an infestation of mites has caused the animal to lose fur and break out in sores. The coyote's ears indicate how cold and miserable it feels. Look what it's standing next to. A poison bait station for rodents. Perhaps the coyote is waiting for its next meal - another poison-laced mouse or rat. Could this be the cause of this poor animal's failing condition? Today we were called out to remove an opossum that had found its way into a garage, squeezing under a slight opening under the front door. It had made itself at home, probably venturing out during the night to do its 'possum-thing, eating slugs and snails and foraging for other edibles, which, unfortunately too often, includes pet food left out overnight.